There is obviously a formidable list of incredible guitarists from the Eighties who continue to impress both existing and budding musicians today. Australia has previously never seen Mr. Big perform here live although we’ve seen various members involved in other tours and guitar clinics over the years. Furthermore, the first and last time that Extreme were in the country was back in 1993. So in that light, a double bill of said bands promised to satiate musicians and rock music fans. As the venue filled up, Mr. Big sauntered out onstage at the early time of 7:45pm to let rip into their well-rehearsed and walloping set. Billy Sheehan inhabited stage right, backed by five bass speaker cabinets and three amplifier heads to drive his twin input signature Yamaha bass. Guitar legend Paul Gilbert, who is nowadays more restrained than in his Racer X days, is still inclined to shred brilliantly. Add the solid drumming from Matt Starr, respectfully replacing the late Pat Torpey and the powerful yet soulful vocals of front man Eric Martin meant that the sound and delivery was virtually guaranteed to be flawless. Opener ‘Daddy, Brother, Lover, Little Boy (The Electric Drill Song)’ saw the use of electric drills fitted with plectrums by both Sheehan and Gilbert for the unison tremolo-picked section. Sheehan’s finger style playing was incredible to witness considering the pace of the material along with the embellishments thrown in such as tapped harmonics, overhand runs and neck bending. Following the more recent and catchy ‘Undertow’, Gilbert’s bluesy playing introduced ‘Alive and Kickin’ featuring some dual soloing and more jaw dropping bass antics with all members contributing vocals. Power ballad ‘Just Take My Heart’ was a vocal highlight from Martin as was the tasteful, chiming guitar introduction from Gilbert. Dedicating ‘Take Cover’ to Torpey, Sheehan’s bass tone was clear and segued nicely into crowd favourite ‘Green-Tinted Sixties Mind’ with Gilbert’s sliding, tapped riff and the groove of ‘Everybody Needs a Little Trouble’ from their latest album Defying Gravity. As red and yellow lights filled the stage, ‘Price You Gotta Pay’ proved to be a hidden gem including some harmonica from Sheehan while Martin assisted his bass lines, a fluid and fast second solo from Gilbert plus some interesting guitar interpretations of vocal lines delivered in a casual trade-off fashion. When Gilbert took to centre stage for his solo part of the show, he did not disappoint. Kicking off with a brief AC/DC riff and accompanying foot stomp, it was soon a collection of neatly compiled guitar solo segments that included trills, muted runs, shredding passages and all done with a lean but expressive vibrato. It was less shred and more blues styled with an emotive execution of passing notes, wide stepped phrasing and pentatonic ideas with a shuffle feel followed by some neoclassical modal endurance runs to appease the shredders in attendance. New album track ‘Open Your Eyes’ followed and saw Gilbert and Sheehan again sync their guitar lines with insane ease. As the stage set was flooded with gold and red, both Martin and Gilbert played acoustic guitars for a faithful rendition of Cat Stevens’ ‘Wild World’ with great vocals. Sheehan’s solo spot demonstrated his mastery of the instrument. Whether it was tapped trilled on the same note to create a flurry effect, the use of sustained chords with the right hand, the two handed tapping skills and sliding right hand harmonics he did it all with a sense of humour, casually looking at his watch mid solo to joke with the audience. Gilbert then traded some licks with Sheehan before Starr’s drumming introduced another debut album track in the fiery ‘Addicted to that Rush’. No prizes for guessing it was time for their massive hit ‘To Be With You’ and the obligatory sing along plus a nifty bit of soloing from Gilbert on a bright sounding slimline acoustic electric guitar whose playing was impeccable. The vocal driven key change in the song was flawlessly performed with soaring harmonies. Of course, to end proceedings of the eighty five minute set, the powerhouse rock of ‘Colorado Bulldog’ continued with the intricate playing amid great band chemistry in delivering one of the best rock guitar live sets seen in ages. 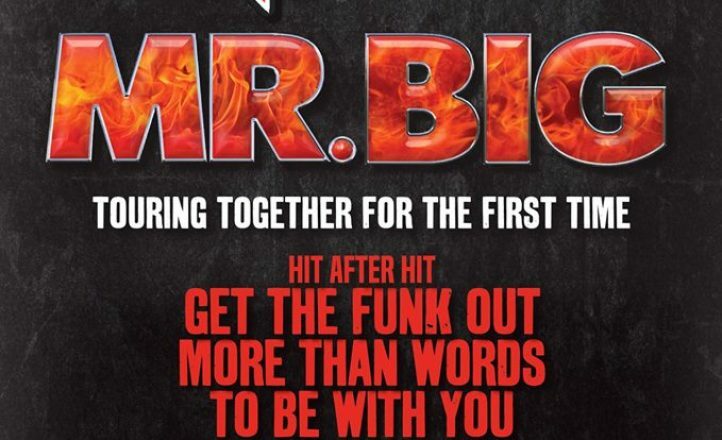 Extreme must have been pretty game to co-headline on this tour as Mr. Big were simply untouchable. Having said that, those who recall Extreme’s 1993 tour knew that guitarist Nuno Bettencourt was going to be firing on all cylinders. Also, the agility of vocalist Gary Cherone with his rich vocal range has let his brief tenure in the Van Halen ranks become more appreciated with the benefit of hindsight since he was last here with Eddie and company back in 1998. Lights dimmed and Bettencourt let his guitar almost talk with a squealing flanger pedal sound reminiscent of early Van Halen before the band appeared onstage and played ‘It(‘s a Monster)’ from the huge Pornograffitti album. Sporting a vest, worn out jeans and with a tussled cape hanging from his waist, the clearly fit Betterncourt whipped his hair around as he put his leg on the fold back wedge to deliver the super-fast guitar solo on his signature Washburn N4. Cherone wasted no time in geeing up the audience as he sang with power. Pat Badger kept the rhythm section underpinned alongside the groove rock filled drumming of Kevin Figueiredo. Their live sound was incredibly loud and almost masked the addition of horns from production tapes but they were certainly a funky addition to the overall mix and vibe. The three punch of material from Pornograffitti continued with ‘Li’l Jack Horny’ and ‘Get the Funk Out’, both of which included fast tapped guitar solos, muted whammy enhanced speed runs and a strong low end rhythm section groove. Badger introduced the latter song while band members jumped around the stage and the drum riser, adding great vocal harmonies where needed and feeding off the energy of the crowd. The melodic guitar soloing brilliance of the Hendrix inspired ‘Rest in Peace’ from the ambitious and interesting III Sides to Every Story album was followed by more impressive musicianship and command of vocal harmony in ‘Hip Today’ from the underrated Waiting for the Punchline album. ‘Play with Me’ was up next and was the only song this evening from the 1989 debut album Extreme. A drum introduction with spot lit percussive guitar intro teased the song’s start but once it kicked in, the band was off and into it with the crowd attempting to sing along. Understanding pace and dynamics in a live show, the band ventured to the foreground of the stage in stripped back acoustic mode with Bettencourt on a twelve string guitar. The songs ‘Tragic Comic’ and ‘Hole Hearted’ allowed for hearty crowd sing-alongs plus more comedic banter with some industry jibes from Bettencourt. Rock mode soon resumed with a couple more tracks from III Sides in ‘Cupid’s Dead’ and ‘Am I Ever Gonna Change’. The song that many in attendance first became aware of Extreme was next. Sitting at stage right, Cherone and Bettencourt performed ‘More Than Words’ as a duet. Introducing it as a classic song they wrote with Led Zep’s ‘Stairway to Heaven’ introduction played on acoustic guitar continued the pair’s comic timing. To finish the show in bombastic rock guitar fashion with the power ballads now done, Bettencourt got stuck into the shred of the age with a sneaky ‘Flight of the Wounded Bumblebee’ followed by the opening riff of the tongue in cheek ‘He-Man Woman Hater’. Both Mr. Big and Extreme were in top form this evening and both had energy to burn with added decades of life experience to add to the authenticity of their music. For this reviewer, this was one of the best rock shows seen in many, many years. Two bands had equal stage time and both were entertaining, well-paced and continue to be highly respected musicians as their live performances proved without a shadow of doubt. Wow, simply brilliant.